ON TOUR: Stop dithering about our airports! 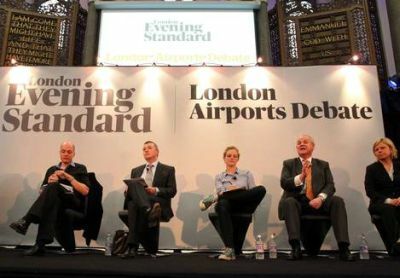 Last week the London Evening Standard, which has the same ownership as The Independent, held an open discussion at Westminster’s Emmanuel Centre on the future of air transport in South East England. It was a well attended evening. Who won the debate is subject to debate itself, suffice to say the discussion, chaired by the BBC’s John Sopel, was lively. We reproduce in BTNews the Evening Standard's own report on the discourse, least we are accused of being biased. We thought it a no score draw. Bill Shankly, presumably in jest, said all those years ago "Some people believe football is a matter of life and death, I am very disappointed with that attitude. I can assure you it is much, much more important than that". Those words can also be used for an airport, but taken much more seriously. The environmental campaigner said she would ban domestic flights “in a second” as she argued that Britain does “not have a capacity crisis”. Ms Omond, an author and founder of the Climate Rush protest group, said better railway connections are the answer and called for the Government to have a better “vision”. She said: “I believe in Britain and I believe in keeping Britain great. Any responsible government would chuck this debate back into the airport bar where it belongs. We do not have a capacity crisis. The crisis we have is a misuse of our existing airport capacity. “Heathrow, at 99% capacity, flies 118 times a week to Edinburgh and 81 times to Manchester. Better rail connections between UK airports alone would release a runway’s worth of capacity for the South-East”. A referendum must be held before the next big aviation strategy is allowed a go-ahead, the writer and philosopher said. “The best mechanism ultimately is a referendum on what we should do with our aviation policy,” he said. “This is a particular issue and the only real way we are going to balance up the needs of business, the needs of the one million people who can’t sleep because of noise, and so on, is by some sort of democratic process”. The Chief Executive of IAG, owner of British Airways, backed Transport Secretary Justine Greening’s calls for an end to what she called the “pub-style debate” so far on UK aviation. He accused the Conservatives of coming out against a third runway at Heathrow in a bid to woo green voters and was sceptical about the benefits of a “Heathwick” solution — linking Gatwick and Heathrow with a high speed rail link. The CBI’s chief policy director said ministers needed to take Britain’s growing aviation needs out of the “too hot to handle box”. She said the private sector would step in to finance bigger airports, adding: “This is not a market failure. It’s a failure of nerve. The market is ready to deliver but it’s the Government’s failure to confront some tough decisions that is holding us back”. The Mayor’s adviser to Boris Johnson said that a failure to build a new hub airport in the South-East would condemn London to becoming a bit-part player in the global economy. He said: “The Dutch, the French, the Germans — they get it. They are competing for our business. They are laughing all the way to the bank. “We cannot expand Heathrow, it is in the wrong place. We need a new, proper airport”. The Evening Standard itself summed up the whole discussion with a fine headline above the letters page the next day “Stop dithering about our airports!